39 is the magic number here at 39AHC. 1979 proved a banner year 39 Years Ago This Month, with the average cost of a new home roughly $72,000, and the annual income to purchase it at $17,500. Hmmm, many wages don’t even make that mark now. There are still states where minimum wages are less than $10 per hour ($19,200/year)! To put it in perspective, home buying averages have increased FIVE times 1979 costs (2016 average $374,650), while wages have essentially stagnated. And we’re not even throwing in groceries and other COL expenses. So 39ers, if no others, let’s make one resolution this New Year. No going back. Make everything you do about moving forward to improve your life. Believe in yourself and trust your instincts. Remember when Disco Duck was wearing thin and we couldn’t wait to move on? A New York musical group put the brakes on our move away from Disco when they forgot Halloween wasn’t ‘til October. The Village People strutted the stage and gave sports stadium organists a new song for boisterous crowds to scream at the top of their lungs. January 6th: “Y.M.C.A.”—like many novelty songs, blasted its way to the top of charts, and lasted way beyond its prime. “Y.M.C.A.” beat out the Streisand/Diamond song, hitting #3 on KHJ’s Top Thirty chart. January 13th: It didn’t make everyone joyful, though. “The” YMCA (Young Men’s Christian Association) was not amused. At least not at first. 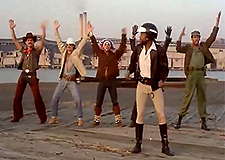 The organization filed a libel suit against The Village People’s song, but eventually saw the benefits of its association, and life goes on. January 26th: Television was not immune to cute and corny. Into our lives roared General Lee, a 1969 Dodge Charger, with The Dukes of Hazzard in tow. 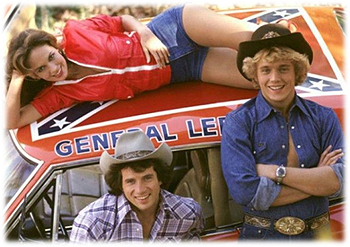 The CBS show that countrified short-shorts left the guys drooling over Daisy, while women swooned over the sculpted bods of Bo and Luke. Talk about high octane! "Yeeeee-Haaa"! Happy UN-Birthday January 39ers! Let’s get back to earth with comfortable Capricorns leading us into the New Year ( Dec 22-Jan 19; like 39AHC birthday gal, Erin, right). Determined and focused, they point us in the right direction after we’ve picked up the party plates. Capricorns make great friends to discuss your future with—they’ll support you, while playing Devil’s Advocate to help you avoid pitfalls you’re trying to ignore. Airy Aquarius (Jan 20-Feb 18) is there to brighten our horizons when we threaten to slide into mid-month, post-Holiday doldrums. Intellectually stimulating with a flair for fun, Aquarius adds sunshine to our dark, stormy winter days. Don’t forget the hot buttered rum … yum! ~ Arnold Glasow (1905–1998; US businessman, author, Glasow's Gloombusters, published at the age of 92.